The logo for the movie, as seen in the sales trailer. 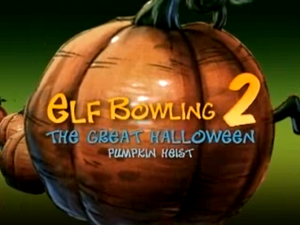 Elf Bowling 2: The Great Halloween Pumpkin Heist was an unfinished sequel to the direct-to-video film Elf Bowling the Movie: The Great North Pole Elf Strike. Both films are based on the notoriously badly rated Nintendo DS game Elf Bowling 1 and 2. The first film was universally panned by both the critics and the public for its low-quality animation and its story. However, despite the extremely bad reception for the film, a sequel was planned to be released in the fall of 2007 that was Halloween-themed. Around the summer of 2007, a sales trailer to sell to distributors for the first film was uploaded to YouTube by gameoftheblog. It included the trailer for the film, but near the end of it, a sequel was announced, with the narrator saying "And, coming fall 2007, Elf Bowling 2: The Great Halloween Pumpkin Heist!". Nothing else from the trailer was actually revealed except for a prototype logo that was probably not used in the actual film. No plot was revealed, but as Elf Bowling the Movie: The Great North Pole Elf Strike was about Santa and his brother being pirates that steal toys before Santa would move on to become the jolly fat man that children love, one could guess that Elf Bowling 2: The Great Halloween Pumpkin Heist would possibly be about Santa trying to steal pumpkins. The film was never heard from again after the sales trailer came out. No screenshots or footage from the film have surfaced, and not much information on the film has surfaced, and the only evidence of its existence is the sales trailer. It's possible that the film was cancelled due to the extremely negative reviews the first film and the video game got. In fact, it seems that many people are relieved that the film never came out, as a lot of YouTube comments on the matter say that they don't mind the film's cancellation. Either way, Elf Bowling 2: The Great Halloween Pumpkin Heist has not surfaced since its announcement and possibly never will due to the poor reception of Elf Bowling the Movie: The Great North Pole Elf Strike. This situation is similar to what happened to Rapsittie Street Kids: A Bunny's Tale, with both films being announced at some part of their prequels, with both movies never coming, most likely due to the negative reception of their prequels. The sales trailer for the first film, announcing the second film.